Going to the Chinese grocery store with my mom used to be a weekly excursion. After she had gotten all of her produce, meats, noodles, sauces and such, we would usually make a stop at the bakery right before heading to checkout. We would marvel at the enormous variety of beautiful baked goods but ultimately, every time we would end up with the same few pastries. My favorite was always the paper wrapped sponge cake. When we got home with our haul, I would quickly rip off the plastic film, peel off the paper, and shove the soft, fluffy, springy, and just ever so slightly sweet cake in my mouth so fast that most of the time I skipped right over that pesky step of eating called chewing. Satisfaction attained. Repeat next weekend. Today's post is the brainchild of my friend Donny, who wants to make Chinese pastries the next big thing. 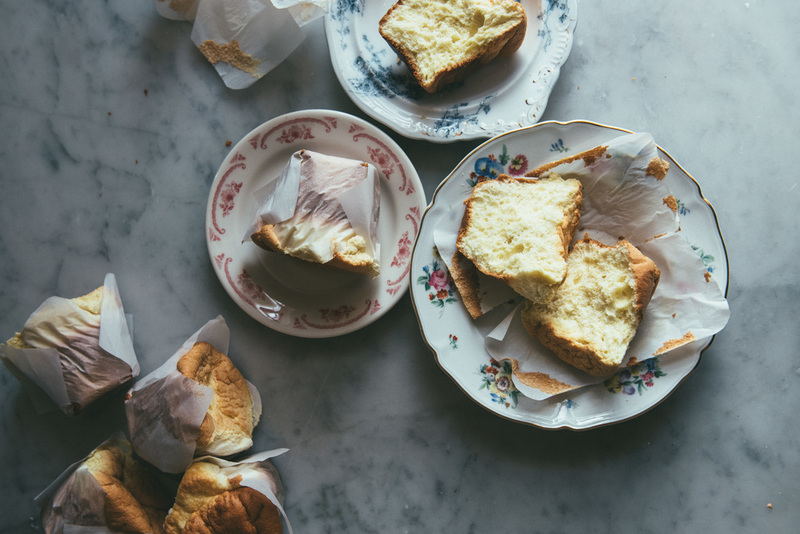 Move over western baked goods, the east is coming. This post could not be more appropriate because 1. Today is the Lunar New Year (happy new year everyone! ), and 2. I'm actually typing these words from China, where I'll be for the next three weeks. Both Donny and this long awaited trip have inspired me to get back to my roots. 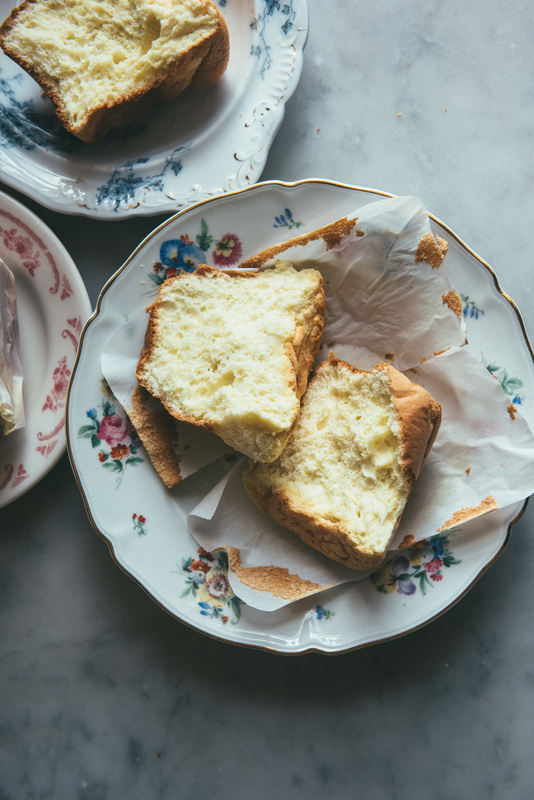 So for the next month, I'll be writing about my travels and also presenting you guys some recipes honoring the upbringing I had in a Chinese family, starting with these sponge cakes. Wrapped in paper, Chinese sponge cakes have this deep golden brown exterior. When you tear the cake open, the inside is light, fluffy, and springs back gently against your fingers if you give it a squeeze. They have this barely-there, subtle sweetness to complement the subtle texture perfectly. They are the most unassuming of cakes, but so delicious they stand on their own, no frosting or other accents needed. Because I wanted to recreate these cakes as closely as possible to the ones you buy from an actual bakery, these little puppies took eight (yeah, 8) test runs to get just right. The biggest challenge was recreating the super airy texture. The key is to introduce enough stable air into the batter by whipping both the egg yolks and egg whites with sugar. Most recipes online also don't use baking powder, but I found that using a little gave just enough extra lift for the best texture. After changing one ingredient at a time, one technique at a time, I'm happy to say this cake tastes almost exactly like what you would get at a Chinese bakery. Hope you guys enjoy, sending you warm wishes from the other side of the world! Makes 6 medium or 4 jumbo cupcakes. Cut four to six pieces of parchment paper into 7 inch squares with four slits on each side (pictured above). 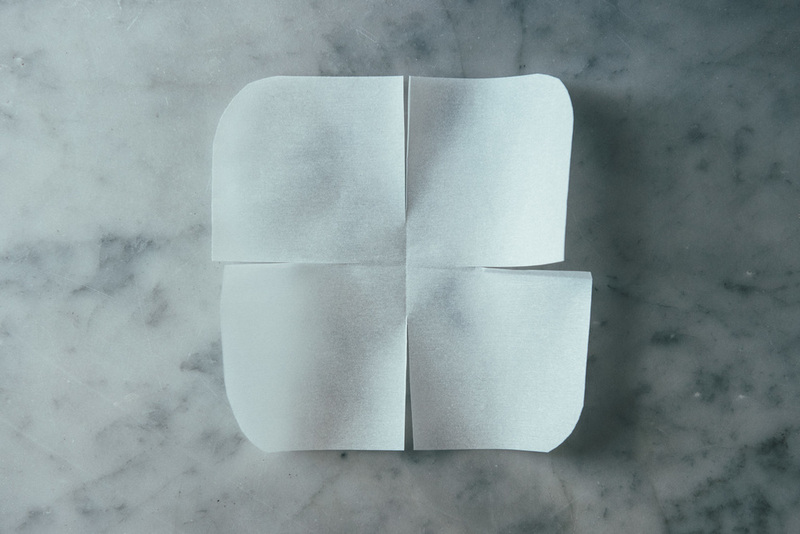 Nest the parchment squares into a cupcake or muffin tin, forming a liner in which to bake the cakes. Preheat oven to 350 degrees F.
Combine flour, cornstarch, and baking powder in a mixing bowl. Separate the eggs, making sure no yolk gets in the whites. You should have 4 yolks and 5 whites. Add the egg yolks and half of the sugar to the bowl of a stand mixer. With the whisk attachment, beat on medium high speed until the mixture is a very pale yellow and has increased in volume by at least double, about 4 minutes. Scrape down the bowl, add oil and beat until smooth, another 1 minute. Add milk and vanilla, and beat again for 30 seconds. 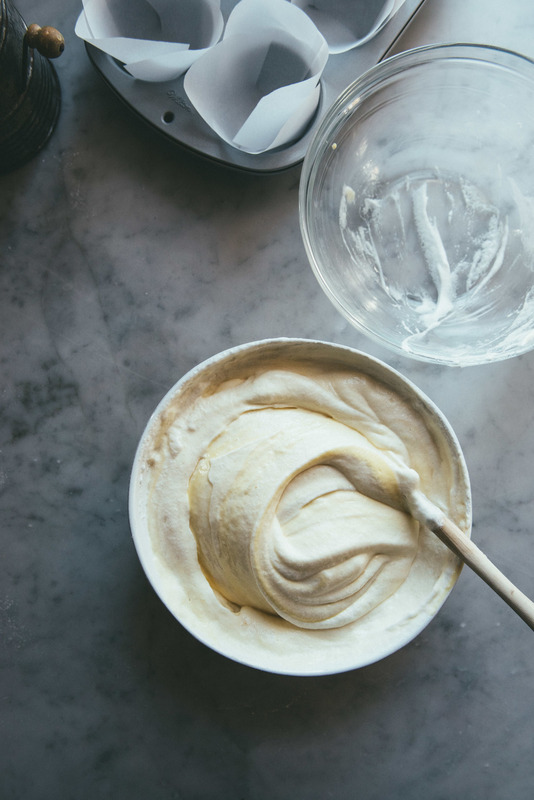 Transfer the egg yolk mixture to a large mixing bowl and clean both the whisk attachment and bowl of the mixer with soap and water. Return to the stand mixer and add egg whites. Whisk on medium speed for 1 minute until frothy. Sprinkle cream of tartar over the whites and whisk for another 2 to 3 minutes until soft peaks form. Turn the speed up to medium high and start adding the remaining sugar 1 tablespoon at a time, beating until stiff peaks form, 1 to 2 more minutes. If you did this correctly, you should be able to turn the bowl upside down and the egg whites won't budge from their place. Sift the flour mixture into the egg yolk mixture. Stir with a spatula until smooth. Add the egg whites and very gently fold into the batter until no streaks remain. 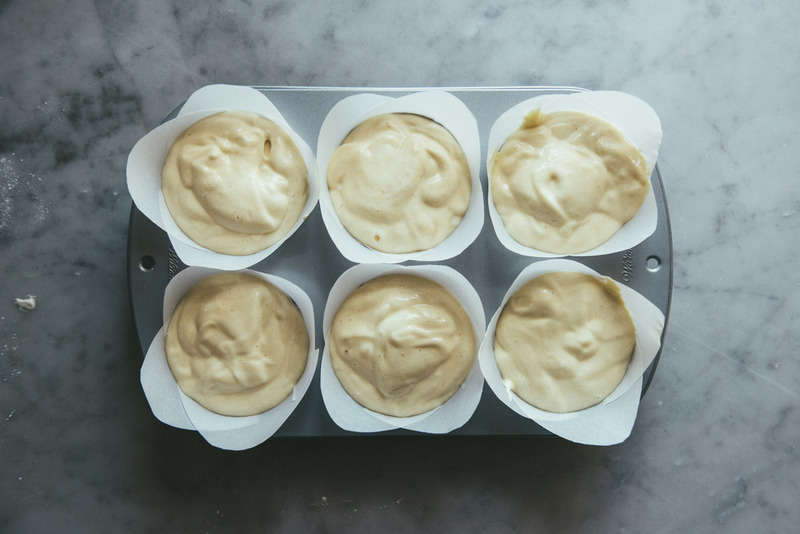 Divide the batter evenly between the cake liners. Bake at 350 degrees F for 20 to 22 minutes until golden and puffy, and a skewer inserted in the center comes out clean. 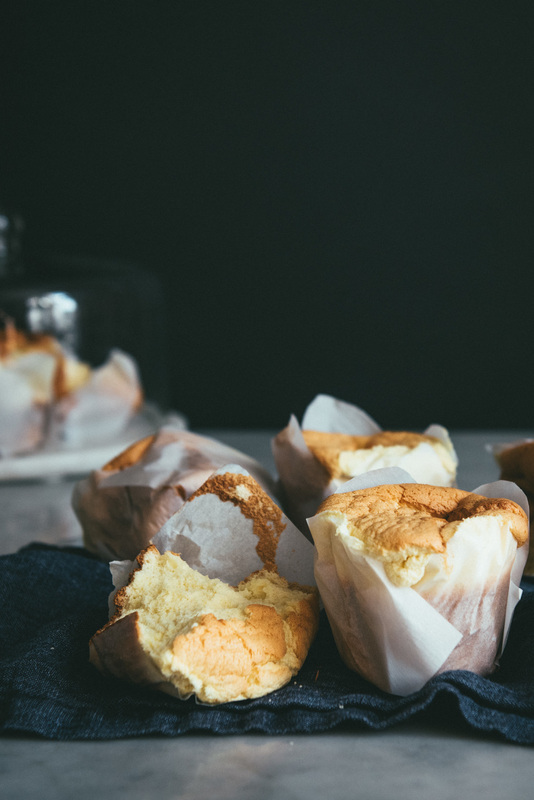 Remove from oven and immediately take the cakes out of the tin and turn them onto their sides on a clean kitchen towel, this helps keep their shape as they cool (they'll deflate slightly). Let the cakes cool to room temperature and enjoy.